SHRIMP ALFREDO FLATBREAD - Homemade alfredo sauce, seasoned shrimp, garlic, onion, tomato and our three-cheese blend. ITALIAN SALAD - Chopped romaine, black olives, fresh mozzarella, roasted red pepper, pepperoni and banana peppers. Served with a warm garlic breadstick. CHIPOTLE SOUTHWEST STEAK & CHEESE WRAP - Sliced roast beef, cheddar, lettuce, tomato, green pepper, onion and our chipotle mayo wrapped in a garlic herb wrap. 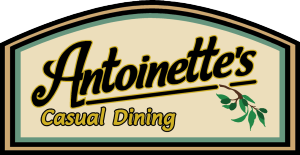 © Copyright Antoinette's Casual Dining All rights reserved. Web design by iQ Web Media.